Urupukapuka Island is the largest off-shore land mass in the Bay of Islands and is a wonderful spot to take a break from boating around on the water. It is one of the only islands in the area where you can camp and there are shower/toilet facilities. Urupukapuka Island is 208 hectares, or 520 acres, and the main landing point is a wharf in the quiet and lovely Otehei Bay. Once off the boat you can head off for a swim, food and drink, a relax, or take half an hour or so and head out on the Nautilus Subsea Adventure to see fish feeding on a man-made reef. The Nautilus is a specially designed vessel that you clamber down into for an underwater view of the surrounds. There are plenty of seats and windows and it is in no-way a sealed-in submarine that will send shock waves through claustrophobics. It is a very gentle journey out to the reef and the Nautilus only heads out when viewing is reasonably good. The crew states this is not a journey to the the Great Barrier Reef - the fish are not tropical coloured beauties in a forest of amazing hues - but "you'll see the many varieties of fish and other marine life that inhabit the underwater world of the Bay of Islands. 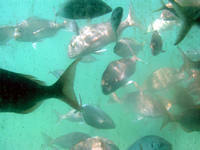 Commonly seen species include eagle rays, snapper, trevally, kingfish, spotty and sea urchins". And you do. I must say watching all those big, fat snapper swimming around having a feed made me think of donning a mask and fins and popping out to do a bit of spearfishing for supper. There are heaps of fish - courtesy of well-timed sploshes with a feeding bucket - and it is quite a sight. The kids will love being so close to the creatures. Actually while I'm firing off a few spear shafts at the fishies I should take a cloth out and wipe down the Nautilus' windows on the outside. They were very spotty and had sea growth waving around their edges. Urupukapuka's Otehei Bay is lovely and so enjoy your stay.